These fluffy bundles are just full of joy and happiness, so it is only right to show them the same emotions they give us and improve their existence as well. Similar to human beings, cats also have the ability to access a vast array of adverse emotions like loneliness, depression, and boredom. These emotions are always on the verge of coming out if we do not put any effort into making our cats happy. Thankfully, cats are not as complicated as humans are, and ensuring they remain happy is actually easy to do once you get into the swing of things. What cats require is for us to meet and satisfy their basic needs like entertainment, shelter, and food. In return, they give us endless head bumps and purrs. 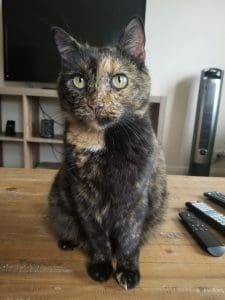 Should you want to ensure your cat is happy, as any responsible pet owner would, but lack the knowledge of how to go about it, below are 15 tips and ideas that can be done at this very moment to ensure your cat is fulfilled and happy. While a trip to the vet might not be high on the list of enjoyable activities for your cat, ensuring the cats remain healthy is extremely important and advantageous to their happiness. It is imperative that annual vet visits are kept to and every sure shot they require is gotten. Created by Jackson Galaxy a cat behaviorist, Catification is a term that means to make the closest environment of a cat richer and more suited to the cat’s personality. A dearth of exciting activities and boredom can contribute to numerous behavioral problems, which is why tiring a cat out both mentally and physically is necessary. Ensuring the space you share with your cat is challenging and fun for it will not just aid with behavioral problems, but also ensure your cat is relaxed and fulfilled. How do you enrich your cat’s territory? You can also use numerous other kinds of furniture that felines enjoy. It is also possible to create this furniture yourself, in a bid to lower costs. It is important to put the furniture in a manner that enables the cat to jump/move from one section to the other. For instance, from the shelf to the sofa and from the site to the cat tree all without the cat having to touch the floor. Cats are naturally neat creatures that prefer their living environment to be clean and neat. These animals cannot bear to use a filthy litter box. Certain cats actually display their displeasure if you do not scoop their poop as often as they would like, by not utilizing the litter box. Cats typically prefer a clean litter box to handle their business. It is imperative to clean the litter box at the very least twice a day, or for greater efficiency, scoop up once your cat makes use of the box. Most people presume that felines are completely at ease spending long periods alone and are very self-sufficient. Although they are comfortable being alone, cats still need the company of humans and desire attention from us every single day. Snuggling and cuddling with a cat daily, playing with them and petting them all over are activities they enjoy. · It is important that your cats have enough toys. For instance, a little mouse which they are able to pick up in their mouth, and toys that help them home their primal instincts, catnip toys. · You can also purchase toys that enable your cat to get adequate playing time, should you be fine for a long period such as automated cat toys. You can also design and create toys if you are adept at it. · It is imperative that you spend playing time with your pet cat. You can make use of toys while trying various games like finding the laser or bathtub ping-pong. · Ensure play is always interesting by creating or purchasing new toys every now and then, whilst also hiding the old ones so your cat is not bored with them. After some time has elapsed, you can bring the old hidden toys back while hiding the new toys. Making use of this method ensures your cat always sees each set of toys as new, fun-filled toys. A happy cat is one that is exhausted. If there is enough time spent with them, playing and challenging them, they are sure to have no cause for complaint. One of a cat’s many natural instincts is to scratch. This is their method for sharpening their retractable claws while also stretching to relax their muscle groups. It is important to note, however, that not every cat has the same preference in regards to scratching. It is best to get a scratching post that fits perfectly with the preference of your cat, so it will enjoy using it, instead of your sofa. If your cat prefers to scratch up a storm on your rug, while the nicely designed vertical post you got for it is lying unused; then it is a sign that your cat’s preference leans towards a horizontal scratching post. The inverse is also true if you witness your cat scratching up your sofa instead of its horizontal scratching post, it is an indication it prefers vertical positions. Having available a horizontal and vertical scratching post is a great idea as your cat might depending on its mood, prefer to use both. Deciding to keep your cat indoors always or allowing them to head out is a major conundrum that numerous cat owners have every now and then. Deciding, either way is usually difficult as most cats meow in the hopes of going outside. If you live in a safer environment like the countryside with a little number of predators, you can let your cat out so it can stroll around, explore new and peculiar scents, laze around in a new sunny location and then finally come back in for the rest of the day. Putting up a fence around your yard is a good way to ensure your cat can enjoy the sun and fresh air while still being safe. The placement of your cat’s litter box is important in fostering great toilet habits. Your cat could avoid using its litter box if it is located in a place that it does not approve of. Conversely, they could still make use of it but be unhappy doing so. Growing a garden for your cat does not take that much time. The blades sprout just a week after planting, meaning your cat can enjoy them quickly. While some cats are quite comfortable being the sole cat in a household, some would eagerly welcome a new cat addition to the family. If your cat seems lonely and is usually alone in the house for the most part of the day, then your cat could enjoy having a new cat friend. Should you decide to get an additional cat, it is important to introduce the cats to each other quite slowly, to enable them to acclimatize to each other at their own pace. Cats typically spend hours lounging by the windowsill to look at squirrels and birds. It is important to ensure your cat has not only a steady view of the outside but also somewhere it can lay down for hours on end basking in the sun. A nice window perch next to the window is a great way to ensure your cat is relaxed while they bird and squirrel watch. It is not news that the majority of cats love their catnip occasionally. Contained in catnips is a chemical compound known as nepetalactone. It is a stimulant with the ability to make cats feel high, making them hyperactive, euphoric and enables them to experience ten minutes of pure ecstasy. Catnip is 100% safe for cats, so owners need not worry when deciding to give them a treat of this plant every once in a while. You can either get catnip a bag, to break out and give to the cat, or you can infuse it in a toy for them to play with. Cats require their own personal time and privacy as well. They enjoy hiding in either a box or a secluded area, where they are able to hide, sleep or rest. It is a great idea to arrange a hideaway for them to head to occasionally. This hideaway can be composed of ordinary cardboard, a cathouse, covered cat bed or an area they feel at peace and safe. Cats enjoy eating and like doing it often. It is important to give cats the right amount of food that fills them, but it is important not to overfeed, especially when they meow and beg for more treats. A veterinarian can assess just how much food you can give your cat by taking into account its activity level and its weight. While it can be difficult to stick to this level, it is imperative not to overfeed as that can cause your cat to become obese, making them unhealthy and less happy. There should always be fresh water available for your cat, as this is particularly important if your cat is being fed dry food. This is because wet food is about 80 percent water while dry food is just 10 percent. Thus, it is important to oversee just how much water your cat drinks to ensure it is drinking enough. While being given the same food every single feeding time has its benefits, it can also be boring and unchallenging. This is even truer for cats as they are wired to make use of their hunting instincts to feed themselves. Rather than just giving your cat food as you have always done, you can offer it mental stimulation and inspire it to search and work for its food. 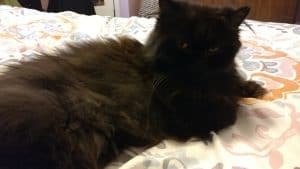 If before reading this, you noticed signs that your cat was unhappy, the above list of 15 tips to bring happiness to your cat is sure to boost things and introduce joyful times into the life of your cat.